This started out as a bigger painting. 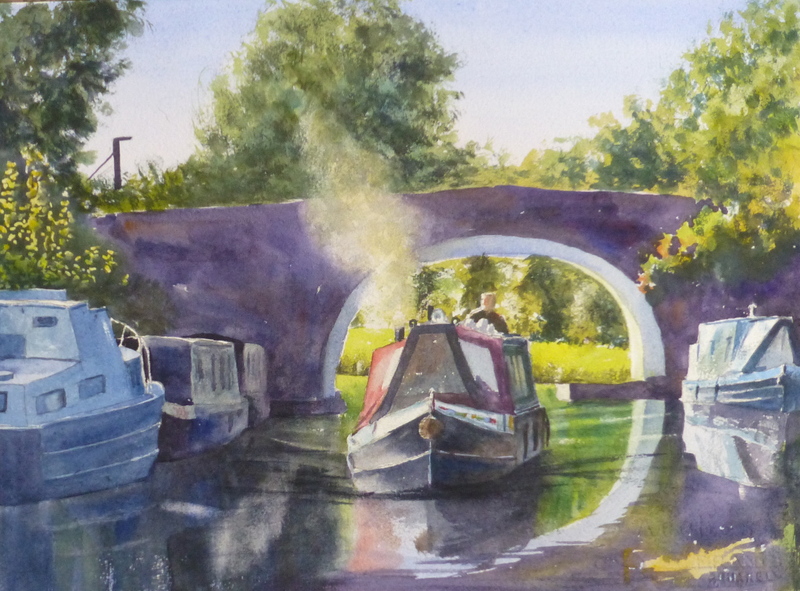 Initially I liked the array of trees in the background and the way they dwarfed the narrowboat and man, but when I completed it, the mass of foliage was boring and overpowering. I decided to cut it down from half imperial to quarter imperial. This is the quarter imperial (36x26cm) painting. I do like the warm colours of the man and lifefloat on the narrowboat, singing out in the sea of greens and the smaller size has put more focus on the boat. I still have some misgivings about the painting and will put it aside to consider it later. 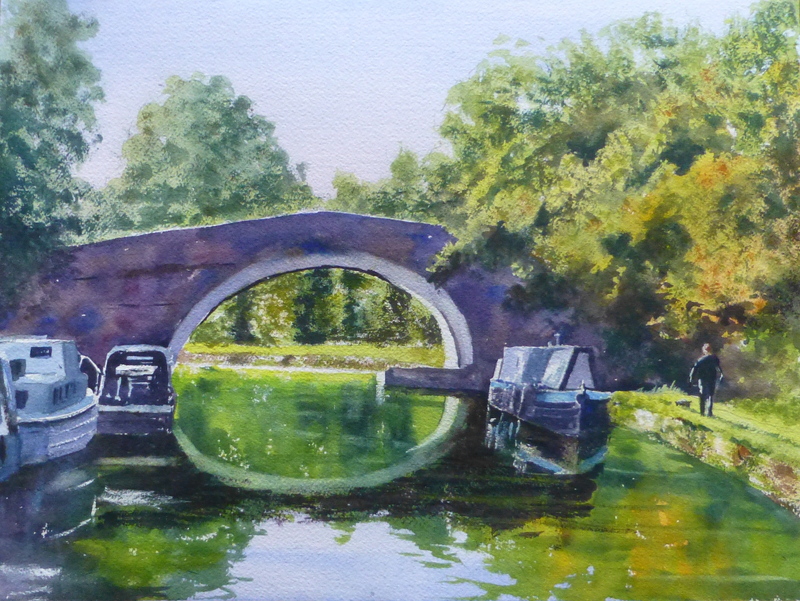 I have liked this scene on the Leeds Liverpool Canal when I’ve been looking for somewhere to paint. There isn’t much, but the light reflecting off the rooftops and coming through the trees and the areas in shade make it appealing to me. I mentioned it to someone who lives in the area and does a lot of painting and they told me that they had been cycling on the path here and had not been paying too much attention to what they were doing (looking at the scenery) and the cycle wheel got caught in a rut and they finished up in the canal. From what she told me the bike is still in the canal . 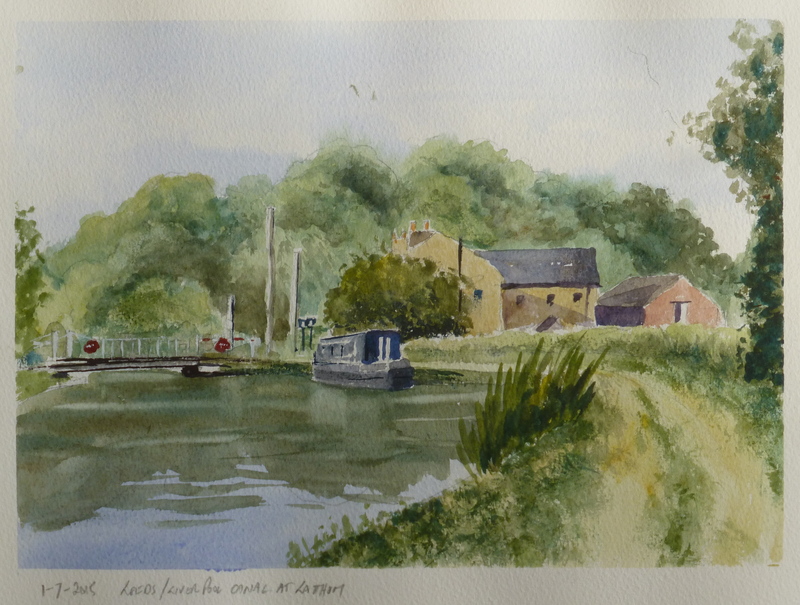 As promised, or threatened, in my last post I said I would present another scene of the Leeds Liverpool Canal from where I was painting the other weekend. After the boats on the left and right had departed another boat came in under the bridge and I reached for my camera. It seemed like everyone was making the best of the good weather to get their narrowboat moored up for winter. I particularly liked the smoke coming from his exhaust or chimney – not sure which – which partially obscured the bridge. With the latest spell of good weather I have been trying to get out and do some painting, although it hasn’t been too successful either in actually getting out and then choosing the time to get out. The other day I went out in the evening and found at this time of year the sun can go down very quickly changing shadows so fast it becomes almost impossible to work. However, last weekend I was able to get out in the morning and wasn’t confronted with this problem. Instead the subjects took off. Luckily I had taken photographs and had actually drawn them in my sketchbook (see below) but first the boat on the left departed and then the boat on the right untied and came up towards me. I did complain to the man behind the wheel that he was upsetting my painting, but he didn’t put the boat back. But it was a glorious morning and the scene was superb and even a jogger stopped by twice to see how I was getting on. The painting above was one I did from a number of photos and the painting below was my on site sketch. As I was doing the sketch, after the boats had departed, another one came under the bridge and I was able to get a photo or two of that which will be the subject of my next painting. The morning proved very fruitful with some great scenes in the low morning sun. 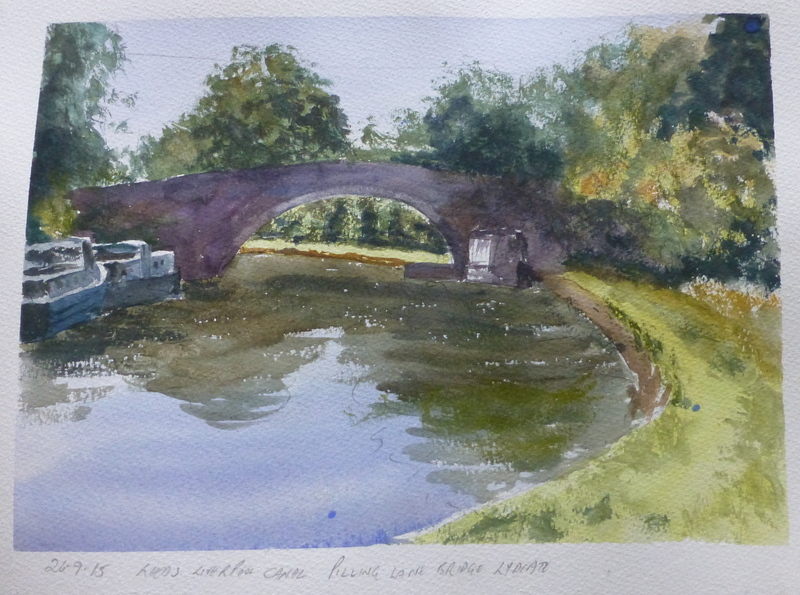 I sat by the Leeds Liverpool Canal one sunny morning the other week and painted the canal by the swing bridge. The on site sketch is below. I thought that the second painting might be better as a wide format image. in the painting. It now seems to have taken over as the subject of the painting. This painting was worked from one of the watercolour sketches I posted on 19th June. I have done this view before in late autumn and the barer trees and autumnal colours give it more of an edge but working in the early morning sunshine was very pleasant. I have been able to get out a bit recently, when the weather allows and I’ll post more of the sketches soon.